I was at Costco and saw a great deal on a Nexus Pro Mend Shampoo, Conditioner and Leave-in Treatment Creme Pack. It was about $20 for the entire pack. The shampoo and condition were both 23 fl. oz. each and the leave-in treatment was 4.8 fl. oz. I knew that Nexus is a salon brand and have heard about it before so I picked it up. $20 for two big bottles and a leave-in treatment is a very good deal. Plus it is a Split End Treatment and who doesn’t need help treating split ends? I checked at Walmart and the Nexus Pro Mend Split End Treatment Shampoo goes for about $15 a bottle, the conditioner usually goes for about $25 for a bottle. 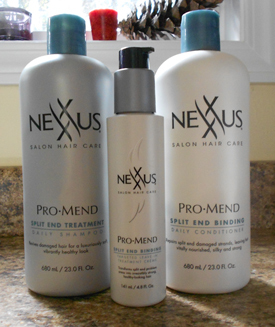 The Nexus Pro Mend Split End Binding Targeted Leave-in Treatment Creme runs for about $10 a bottle. So I definitely found a good deal price wise. The Nexus Shampoo and Conditioner claim to bind split ends back together in just one use. It says it will bind up to 86% of split ends back together in just 3 washes. The Nexus Pro Mend Split End Binding Targeted Leave-in Treatment Creme is suppose to transform split ends into a healthy-looking hair. It says it is the first product to focus on true split end repair and that it binds split ends back together in one use. My first impression of the shampoo and conditioner was that they smelled great! Probably the best smelling shampoo and conditioner that I own or have ever used. It almost has a sweet smell to it. The treatment creme smells very similar to the shampoo and conditioner as well. The shampoo lathered up very well in my hands and left my hair feeling clean. After my first use I didn’t really notice my hair looking any different than my drugstore brand shampoos and conditioners. As a matter of fact I didn’t like the Nexus Shampoo and conditioner better than anything I currently have in my shower. Usually when I wash my hair with a new shampoo it feels great after. I didn’t really notice that with Nexus. I didn’t notice my split ends looking any better either after using all three products. For starters, I know you can’t mend your split ends. You can’t reverse that damage, you need to cut them off. I wasn’t expecting the products to fix my split ends at all but I was hoping it would leave my hair silky smooth. I was sort of disappointed that I hyped myself up thinking it would be a fabulous shampoo and conditioner. I mean, it smelled great, it was a salon brand so I thought I would love it. I don’t feel that I wasted my money on it as I have almost used up all the bottles and it lasted awhile. I just don’t know if I will buy it again. I would probably buy it again at the Costco price of $20 for all three products just because I love the smell. But I would not pay full price for any of these products. If I had of paid $20 per bottle I would have definitely returned the bottles. I wouldn’t recommend these products, I was actually surprised to see the leave-in treatment creme in my Cosmopolitan magazine shortly after I purchased it. I’m skeptical about trying another Nexus product as I wasn’t impressed by these three things. Have you ever used Nexus hair products? What do you think of them? Would you recommend them to your friends?